Foursquare warned us but now it’s finally here. 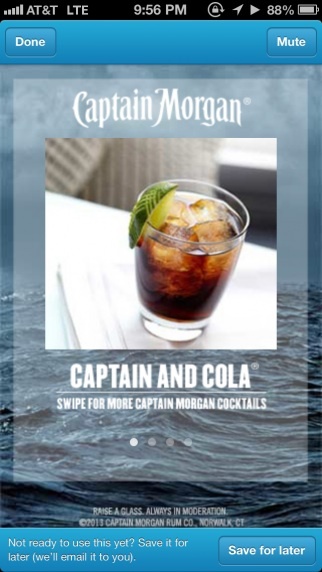 The first ads showed up on the social media company’s mobile app today, including one promoting Captain Morgan rum. The new advertisements are targeted, meaning you’ll see the above ad when you check-in at a bar. Ads show up in the Explore tab, joining the promoted listings we’ve come to accept. They aren’t too intrusive, thankfully, though Foursquare has declined to reveal how much it’s making off the minor annoyance its users will be enduring. The ads will also be used by companies looking to lure consumers into their stores after they check-in at a nearby location or one that fits a certain profile. For example, check-in on Foursquare at a playground or daycare center and the app may serve up a a 20-percent-off coupon for Toys R Us. The company also plans to use its data to divide users into categories including “Mobile Mass Market Mom,” “Business Traveler,” and “Luxury Affinity,” according to slides published by Valleywag in April, though Foursquare chief revenue officer Steven Rosenblatt told AdAge that the company won’t let advertisers target individual users directly. Rosenblatt also notes that the social network won’t let companies use check-in ads barge in on with competing companies, which he referred to as “conquesting.” For example, you won’t see a Burger King coupon pop up on your phone after you check in at McDonald’s.